The decor is Nipa Palm, meaning a Northern Style House. The food was great- whole fish in spicy sauce, fresh veggies and noodles. 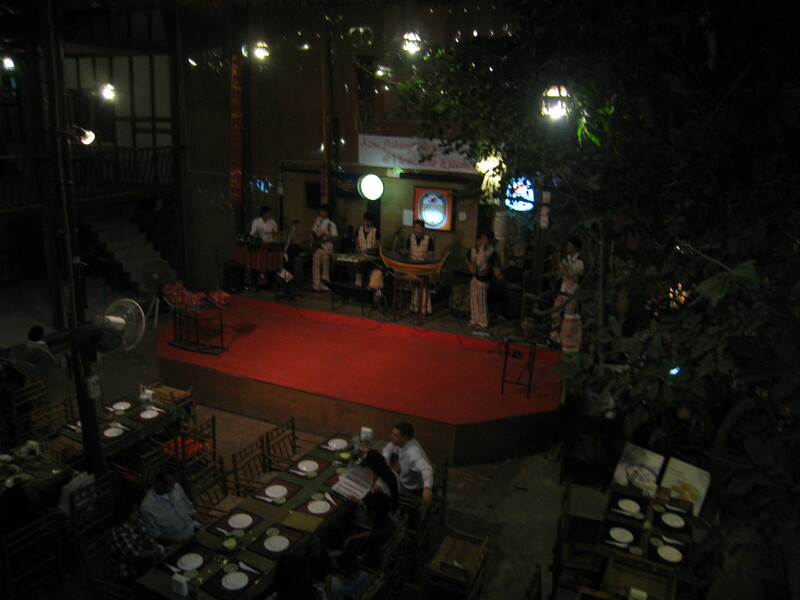 There is a “show” of northern style music, it is a large band playing wooden instruments made primarily from bamboo. The music sounds a bit like Mariachi in that you can enjoy it without understanding any words, there are long instrumental interludes. There were also dancers in traditional Thai dress and some Thai sword fighting (with actual swords). What struck me was the number of Thai business men coming to eat and see the show- also a large number of Thai people holding their end of year parties and birthdays. How does this translate to my culture? Where do we go in America to see this kind of show or our heritage? We have lots of shows, Beach Blanket Babylon in SF and the vast number of Broadway plays in NYC. We have country music (wretch in mouth). What makes Thailand unique is the ubiquitous culture that is adapted to different parts of the country. What is endearing is seeing Thai business men taking pictures of a “show”. America is wonderful for our diversity, we need many shows to express our culture. Thailand has one culture and they like to see it and celebrate it for more than just the tourists. This entry was posted in Bangkok, Food & Restaurants, Thailand and tagged bangkok Essan. Bookmark the permalink.